Portable air conditioning units are designed to cool a single room and will instantly start cooling it down. They are exceptionally easy to use and simple to setup. All you need to do is put an exhaust hose out a window (to vent away the hot air) and switch it on for instant cold air. Portable air conditioners are most commonly used in homes, offices, shops and server rooms. They are hugely effective in hot weather and provide a very satisfying cold flow of air. Mobile aircon units all come on wheels and are easy to move around. If you need to carry them up a flight of stairs then you may need two people. Evaporative coolers are a very effective, economical and environmentally friendly method of cooling. Please use in a well-ventilated area to get the best results. 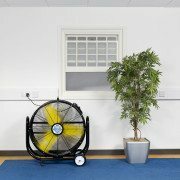 We offer a range of high-performance industrial fans. They are very powerful and most often used in warehouses, shop and events. They move vast quantities of air which provides much-needed ventilation in a room. They do not lower the temperature of a room; however, the fast-moving air makes people feel much more comfortable. Our most powerful fan (The Blue Max 950) is often used for special FX in photo shoots and films. This is an ex-hire model. It is unboxed and may have some cosmetic scuffs but is in full working order. With massive air moving performance the BlueMax 950 Industrial Fan performs like no other. 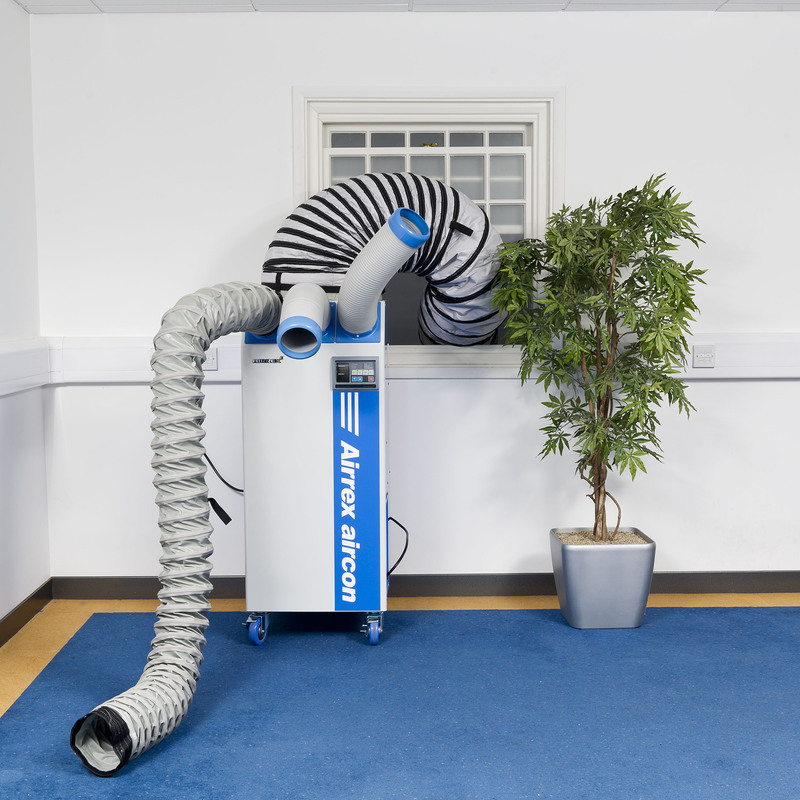 The BlueMax is a very powerful unit for large areas up to 3500 ft² and produces a massive 37,000m³/hr (20,000 cfm.) airflow…. LOOKING TO HIRE A UNIT? We also hire units all over London. We offer same day delivery to get you cool quickly!